Gorgeous blue lakes, snow covered mountains on all its sides and a view to die for- Yes! We are talking about the Gokyo Lakes. 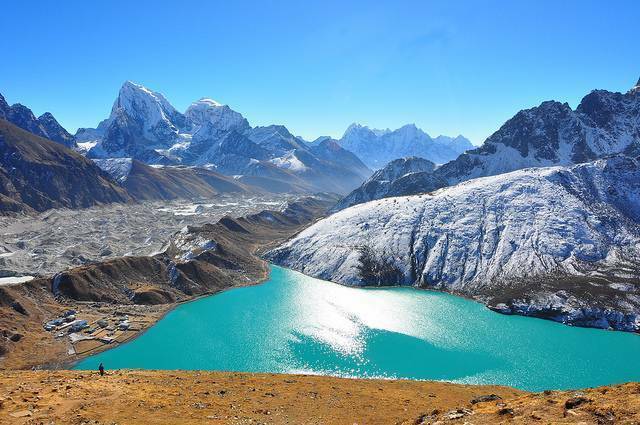 Gokyo valley has a great reputation among adventurous souls and the adrenaline junkies. The Gokyo Lakes are 6 lakes and are oligotrophic lake in Nepal and is among the world’s highest freshwater lake system. This Lake happens to have an interesting history. It is considered to be sacred by both Hindus and Buddhists. During the month of August, hundreds of Hindus take bath in this lake during the Janai Purnima festival. Another interesting fact is that this site is worshipped as the residing place of Nag Devata. This has proved to be a boon for this place since the localities consider it inauspicious to harm and flora and fauna in this area. Providing a mind blowing view of the Everest, this place is blessed with abundance of natural beauty. The Gokyo Lake and the valley are sure to soothe your mind and provide you peace. Enjoy the panoramic view of 800 m high mountain ranges!